Weekend warriors who shoot hoops with their pals are at risk of becoming heroin addicts. It’s actually not a National Enquirer statement. By now we know that professional athletes pay an incredible price over time for their sports prowess. Injuries lead to opioids. Some become addicted to opioids. We hear about it more often at the college or even the middle school level. And we hear about it most often in football. But it happens in basketball (any sport, quite frankly), too. “Basketball is a contact sport, football is a collision sport,” legendary NBA superstar Grant Hill said in a one-on-one interview with SobrietyResources.org. So why don’t we have a better deal to offer athletes who get injured? More than just addictive, harsh opioids for treating their pain? And its spokesperson is the picture of health even after 11 surgeries during his two-decade long career of NBA superstardom. Looking good, feeling good and doing good comes naturally for Grant Hill. Why? Opioids haven’t ravaged his body, even after 11 – yes, 11 – surgeries. Hill dribbled down home courts for Detroit, Orlando, Phoenix and Los Angeles before becoming co-owner of the Hawks. The miracle for Hill is that he did not become addicted to opioids or even have to suffer their ill effects. Hill does not proclaim to be an ironman hero in that regard. Like many people, they made him extremely ill and did not bring relief. He had no choice but to seek alternative methods as he sustained injury, after injury, after injury. While incoming NBA players are trained on the essentials of good health, Hill said they don’t get a lecture on opioid addiction. One wonders how much of a lesson they get from coaching staffs in high school or college. “It’s not discussed from the ‘git-go’ (the words the interviewer posed), but more discussion overall about good health,” Hill explained. “Nutrition, training, listening to your body. If your body talks, you have to listen. Sometimes, you have to learn how to listen,” Hill said. Today, Hill is helping others on the court find pain relief and avoid opioid addiction. The Hawks franchise, in conjunction with Emory Healthcare, recently opened a new sports medicine center in the Atlanta suburb of Brookhaven. It serves as the Hawks’ primary training site. It offers cutting-edge approaches for managing pain whether it be from surgery or injury. Hawks Principal Owner Tony Ressler explained in an NBA news release. From analyzing players’ sweat for nutritional analysis to using 3D technology called “motion capture,” Hill intends to keep his Hawks flying high and healthy. Hill said it gives his players a choice when it comes to pain management after a surgery or injury. “Hopefully you can avoid surgery,” Hill said. “But we need to have a healthy conversation about what’s happening in sports, including our ‘Weekend Warriors,’ and have a dialogue with surgeons about our options. What is the United States of Non-Dependence Report? Cleverly named but equally as important, this report highlights important information that far too many Americans seem to be tuning out on the evening news. Surgeons generally know whether a patient may be at risk for opioid addiction based on algorithms usually provided by insurance companies and the like, Sethi explained. A hybrid of opioid and non-opioid options can be used when appropriate, Sethi said. It’s called Exparel, and it’s how Hill has found relief. There are plenty of non-opioid pain options, even for – the doctor himself said it – shoulder replacement. Sethi explained a pain reliever called Exparel has evolved quite a bit since first becoming available. It is gaining credibility as a viable option to opioids for sports injury-related surgeries, he said, and even is being used on children. Sethi is renowned for repairing elbows, knees and shoulders at Orthopedics & Neurosurgery Specialists. His groundbreaking research regularly is published in medical journals. Hill is helping spread the word about a new website that explains alterative pain management methods. It’s important for people to understand, Dr. Sethi said, that pain is subjective. It’s why it can be a tricky call when prescribing opioids. “Pain is personal, no two people experience it the same way,” the website explains. “Your doctors will develop a pain management plan based on your particular needs, which is why it’s important to discuss pain treatment options. 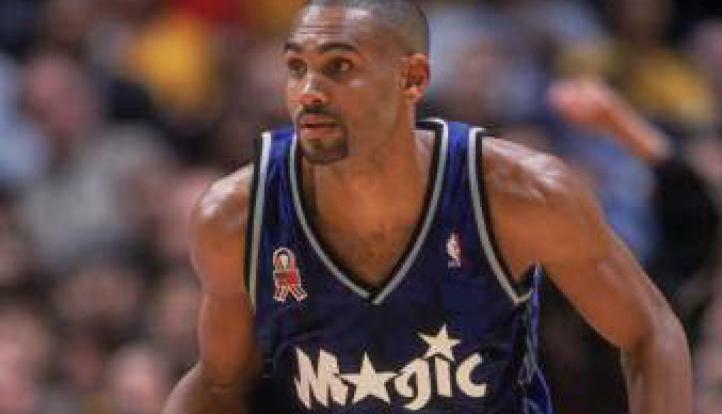 From 1994 to 2013, Grant Hill became a basketball icon. Today, he’s host of “NBA TV’s NBA Inside Stuff.” He’s a millionaire and has a beautiful wife and children. “Have a game plan,” Hill advised athletes of all kinds when it comes to being prepare for an inevitable painful injury. Share your story, with that hashtag, of why you would like to pour your opioid painkillers down the drain. For more information, go to planagainstpain.com.